Modern technology in schools is great when it’s working, but in hot and dusty environments it can be a big challenge. Rotary Zanzibar in Stone Town had seen plenty of problems with technology, particularly second-hand laptops which struggle in the heat, dust and salty humidity. The content, developed in Kenya, in delivered in either English or Swahili and is perfect for East African primary schools. It includes stories, comprehension exercises, interactive language learning, reference materials and games which teach numeracy and thinking skills. As a result, other kits are now working in Zanzibar and neighbouring Pemba Island. The local Rotary club worked with an American club to fund a second Kio Kit for the Zanzibar Learning 4 Life Foundation, an afterschool club in another resource-poor part of the island. Zanzibar Schools Project (ZSP) is inspiring young people in the UK to get involved with Rotary. 17-year-old Rob Lindfield volunteered as an English teacher with ZSP during his Summer holidays. He engaged with the local community and developed a keen appreciation of local needs, particularly in finding work. Since returning he’s built a strong connection with Brighton and Hove Soiree Rotary Club, the organization behind ZSP. Rob’s partnered with Zanzibari teacher, Gasica, to set up a microfinance project. Students from Varndean School in Brighton review applications from young people in Zanzibar. One of the first to benefit was a poor but hard-working young man who wants to be a chicken farmer. He’s determined to pay back the loan as quickly as possible and so help other people in his situation. 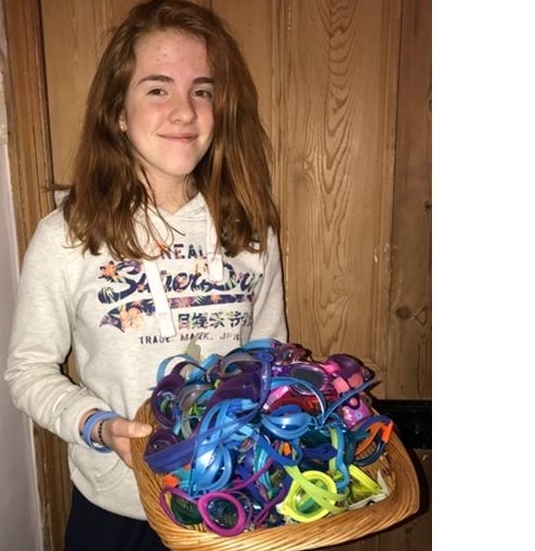 Amber Bayford, a teenager from Suffolk has raised money to buy swimming goggles to help children in Zanzibar learn to swim. She’s now hoping to raise funds for swimming lessons that will help prevent the many unnecessary drownings by young people on the island. The students in Safari English Club are curious about the world, even though they have so few windows to look through. Our volunteers Kristina, Lucie and Jack are passionate about giving them opportunities that most children take for granted, such as learning more about the sea that surrounds Zanzibar and the consequences of pollution. Waste management is poor in Zanzibar: because there's no state service to take care of rubbish, residents often just throw it onto the streets or onto the beaches with no thought to what happens next. Earlier in August “Giving Nature A Voice”, a series of environmental documentaries produced by East African filmmakers won one of the top awards at the Zanzibar International Film Festival (ZIFF). The series (originally broadcast during primetime on Kenya’s national TV) features in-depth reports on Africa’s most urgent environmental crises and has generated public debate and mobilized action to defend East Africa’s wildlife and environment. Kristina, Lucie and Jack built a project inspired by showing the video to Safari English Club. We’ve shown various films to the students but find that the ones that relate to African themes are the ones they find most motivational. Protect our Ocean! project included getting the students involved in a clean up of the beach which is a couple of miles away from the school. The older students learnt vocabulary associated with the environment and put together a giant poster which is proudly displayed in the school. It’s the first poster they’ve produced an in the photos that follow you can see how delighted they are with the results. Jack, Lucie and Kristina also produced a short video about the project.